Charming Thought stunned odds-on favourite Ivawood to win the Middle Park Stakes on Future Champions Day at Newmarket. The 22-1 victor, trained by Charlie Appleby, gave Godolphin its first Group One win of the season in the UK. Jockey William Buick collared the previously unbeaten 1-2 favourite, ridden by Richard Hughes, late on. Belardo won the Dewhurst Stakes while Together Forever took the Fillies' Mile as all seven favourites were beaten. Day One of Champions Weekend, with the second day at Ascot on Saturday, was a bonanza for the bookies - with the winners priced at 16-1, 16-1, 22-1, 7-1, 10-1, 8-1 and 20-1. Earlier, Royal Razalma (16-1) won the Cornwallis Stakes for trainer Jonathan Portman and jockey Richard Kingscote. Belardo, patiently ridden by Andrea Atzeni, reversed form with Estidhkaaer to provide another success for Roger Varian, who won his first Classic last month with Kingston Hill in the St Leger. The 10-1 shot showed a smart turn of foot to beat runner-up Kodi Bear by two lengths. "This horse will have confidence going into the winter now. 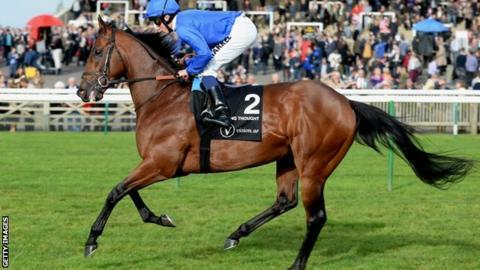 We will now have to dream about the 2000 Guineas," said trainer Varian. Another favourite was beaten as Godolphin's Lucida could finish only third behind 7-1 chance Together Forever, with Agnes Stewart staying on for second. Joseph O'Brien, riding for his trainer father Aidan, was winning for the second time in six days on the filly, who had lost her three previous races.